Four Bahrainis who have joined the militant group ISIS have called on other Bahrainis to take up arms and join the fight against their ruling “tyrants”, the Sunni Khalifa royal family and the country's majority Shia population, in a YouTube video that surfaced on social media and recently went viral. One of those who appeared in the video threatening the Bahraini regime is Lieutenant Mohamed Isa Al-Binali, whose defection from the Bahrain Defence Forces was reported on Global Voices earlier this year. Alongside, three other Bahrainis, who go by the aliases Abu-Laden Al-Bahraini, Abu-Alfida Al-Salami and Qaswara Albahraini, appear. Mohamed (abu-Isa) graduated from the Police Academy in 2013 and was supposed to be a prison guard in Bahrain's infamous prisons, which have practiced systematic torture since 2011. Bahrain's Ministry of Interior issued a statement saying that he was sacked from his job because of his absence earlier this month. According to Arabic-language news reports, he had been in the ranks of ISIS for over four months. Mohamed comes from a famous family in Bahrain, the Binali clan, which is closely affiliated to the Al Khalifa ruling regime. His cousin, Turki Al-Binali, who goes by the alias Abu-Sufyan Al-Salami (Al-Salami refers to the tribe of Sulaim in Arabia), is a high ranking preacher in ISIS. Prior to holding this public position in the terror organisation, he was arrested and released many times before in Bahrain. In the video that follows, you can see him leading a protest in front of the American Embassy in Bahrain; that protest was not attacked by the authorities like the opposition protests usually are. His books can also still be found in libraries and bookshops around Bahrain in a country which bans hundreds of websites which oppose the government. The BinAli affiliation with ISIS is longstanding. In May, Turki published information of yet another of his cousins dying while fighting within ISIS. Bahrain consists of a Shia majority who have been complaining of marginalization for decades under the ruling Sunni royal family. In a response to a popular uprising in February 2011, “the Bahraini regime responded not only with violent force, but also by encouraging a nasty sectarianism in order to divide the popular movement and to build domestic and regional support for a crackdown,” wrote Mark Lynch at Foreign Policy. Now that this video is out, with its clear and loud message which has receptive ears in some circles in Bahrain, let's wait and see how the Bahrain regime deals with this new escalation of real terrorism from people within its ranks. 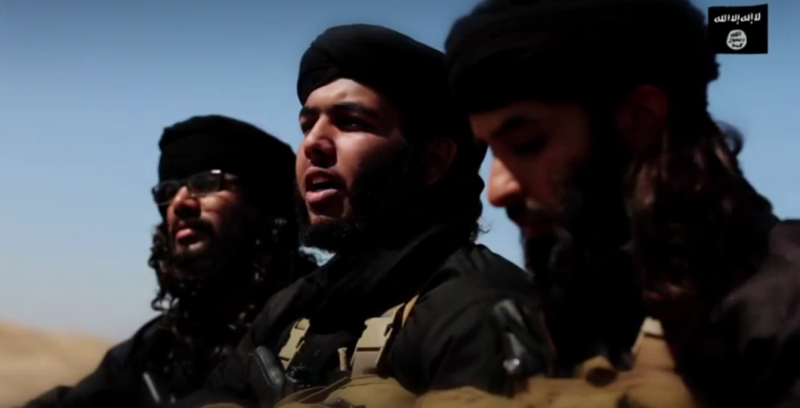 Global Voices will not republish the video in question so as not to further spread ISIS propaganda and hate speech.